Flat Shank for Home Sewing and Embroidery Machines, Size 12, 14, 16 for Sewing Specialty Machine Threads (Schmetz 130N Topstitch is Nickel Plated). Also for Heavier or Double Threads used Brother PR600, PR620, PR650, PR655, PR1000 and Babylock Multi Needle Embroidery Machines. This special needle has a very long, almost double length, eye. It is made for Top-Stitching or Decorative stitching and will accept heavy or multiple threads. It can also be used for embroidery with heavy, metallic threads. It is availble in chrome or PD/titanium finish. 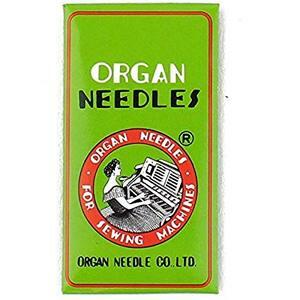 Organ Needles are Chrome Plated (Finish). Organ no longer labels “CF” Chrome Finish or “CP” Chrome Plate because that is the “default” finish for Organ Needles. The same is true for Groz Beckert & Schmetz as they too don’t label all of their needles “CF” either. The most popular needle, the Universal, has an eye that is 40% the width of the blade. Really! There are three other needles with larger eyes, the Embroidery and even more pronounced is the elongated eye of the Metallic and Topstitch needles. Now what does a larger eye mean? There is less friction on the thread as it passes through the eye. Ever sew with a thread that breaks or tends to shred? Guess what, use a needle with a larger eye. If you have old thread or maybe a poor quality thread, use a needle with a larger eye. The thread and needle work hard and fast. Help them out when you can with a larger eye.